One of my favorite pieces of vintage red. 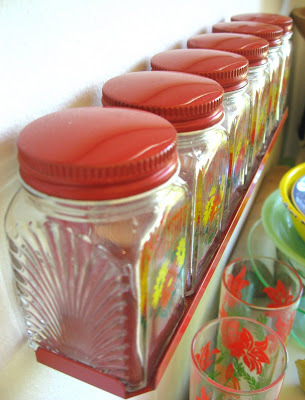 Six clear glass spice jars, with charming and colorful decals, neatly contained in their own little red wall rack. The decals chip any time they're touched, though, so I'm wondering if there's anything I can do (besides never touch them) to preserve them on the jar without marring the appearance. Hmm. Oh, these are just so lovely! Sorry I don't have an preservation tips. Not sure how to preserve these beauties...but I do love them! I have some amazing green glass hoosier shaker jars. They are kind of rounded square like yours, but I use mine for salt and pepper shakers. They don't have anything printed on them, but I LOOOOVE them! 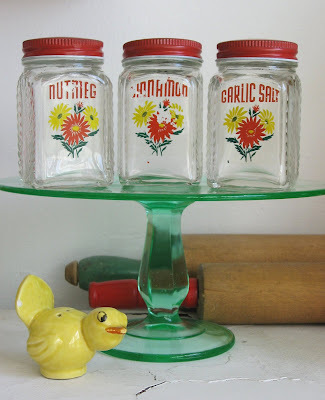 I looked forever for some special S&P shakers and I found them at an estate sale...$10...yay! They are darling. :o) I sell reproduction decals and I advise my customers to spray the decals (once they are applied) at least a couple of times with Krylon before using them. It's not a perfect solution, but it will help a lot. You can do the same with yours and at least stop the damage where it is now. 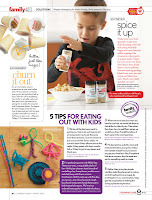 Take off the lids, empty them of spices, then lay them all on their backs (decal side up) on a cookie sheet or some kind of drip rack, over newspapers, then spray evenly with Krylon or something similar. Let them dry, then recoat at least once more. Oh no! I don't know how to preserve them! But they are so great! Really useful info, lots of thanks for your post.